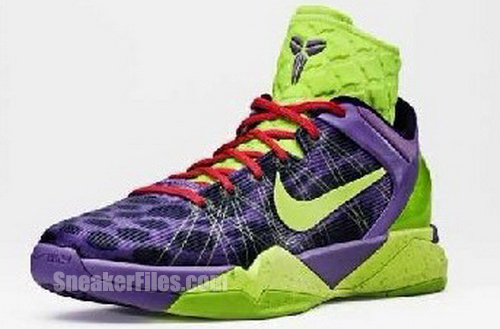 I give you the Nike Zoom Kobe VII. He’ll be wearing these suckers on Christmas Day. Just hideous. Bright green and purple? What a joke(r). Zing! Somebody remind Kobe his nickname is The Black Mamba… not The Black Puma, The Black Panther, The Black Leopard, The Black Cheetah, The Black Lioness, or The Black Some Other Big Cat on the Heal of His New Shoe. This entry was posted in Basketball, NBA and tagged Kobe Bryant, kobe christmas day shoes, Lakers, Nike, nike shoes, Nike Zoom, Nike Zoom Kobe, Nike Zoom Kobe 7, Nike Zoom Kobe VII. Bookmark the permalink.